T’ai chi is an ancient internal martial art-a mindful martial art- focusing on smooth, slow movements that cultivate inward focus and free energy flow. Because it’s based on movement and flow, some people even call T’ai chi a moving meditation. T’ai chi is rooted in the Taoist philosophy of harmonious living. T'ai chi's gentle, flowing movements have been used since ancient times to release stress, heal chronic health problems and slow down the process of aging. This is done through mind body exercises that develop chi, the life energy that flows within us. Tai Chi training brings many benefits, including: toned muscles; improved posture when both still and moving; better balance and coordination; greater self awareness; and increased well being. 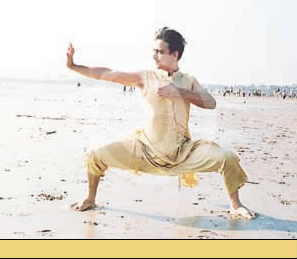 The stress release and relaxation response created by Tai Chi also help general health and peace of mind. Tai Chi movements encourage Chi to flow through the acupuncture meridians of the body and clear any blockages, to maintain good health. At the end of each training session, the energy generated is stored in the Lower Tan Tien energy centre. The Lower Tan Tien is a major energy centre located just below and behind the navel. As time goes by, you accumulate more and more energy, which strengthens your resistance to disease and provides a reserve which can be called upon in times of need.